One last Card Club card! Hi! Here is the last card we did at our October Card Club! 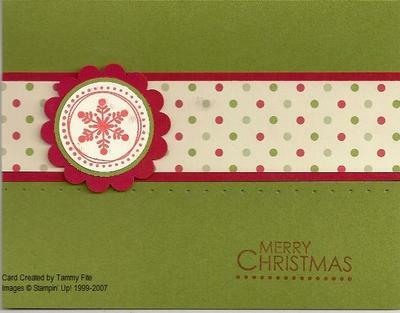 I used Old Olive for the card base, and layered a strip of Real Red, then a strip of Dashing Designer Paper. I used my Crafter's Tool Kit to punch the holes below the strip of Real REd. 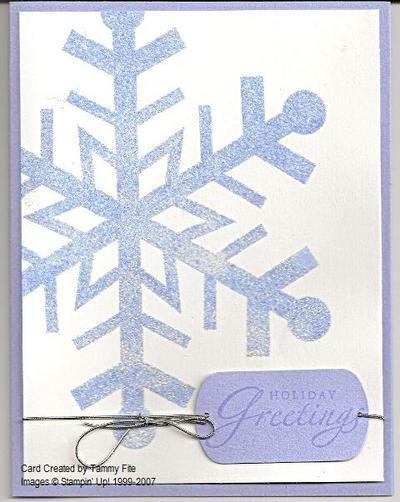 Then, I stamped the snowflake from Season of Joy Stamp set in Real Red ink, punched it out using the 1 1/4" circle punch. I then punched an Old Olive circle using the 1 3/8" cirlcle punch. Layered both of those onto a Real Red scallop cirlce! 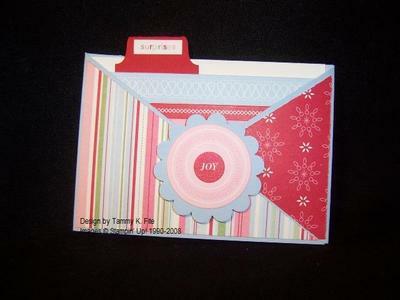 Very simple card--it would be easy to make 70-80 of these!!! To make the sentiment, I just stamped the words in Almost Amethyst ink onto AA cardstock and punched it out with the Key tag punch! 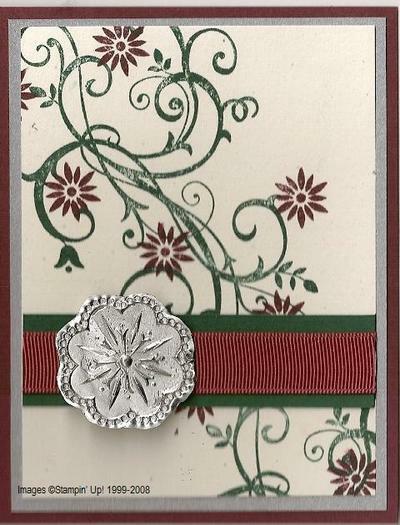 I used the stretchy silver cord around the card. This stuff is sooooo much better than the "old" cord we used to carry! Gotta have it!! Hi! I've been working hard to "get ahead" on my blog posts!! My mom is coming to visit this week, and I probably won't be on the computer too much! So, you'll see new posts each day, but it may take me a couple of days to return emails or answer questions!! Another card from our October Card Club! 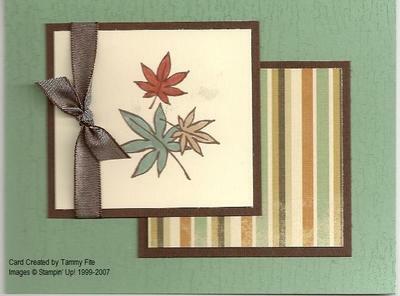 This one is made using the Artfully Asian stamp set. I stamped the leaves in Basic Brown, then colored in using markers! 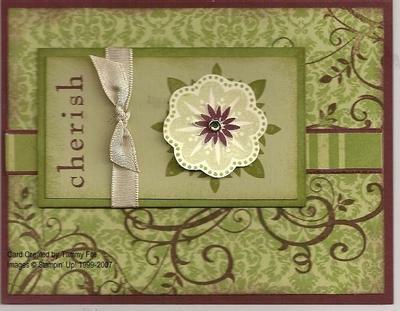 Ink: Basic Brown pad; Sage Shadow, Really Rust and Creamy Caramel Stampin' Write markers. I'm so excited!! I spent most of today stamping, and getting ready for my stamp camp next Saturday, as well as several craft fairs I'll be doing in November and December. I was "playing around", and came up with this design!! It's a criss cross card, but in the size of a gift card!! I used Bashful Blue as my card base. 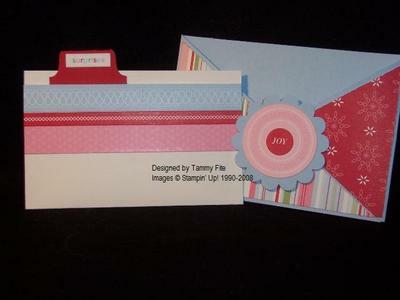 The designer paper is all from the Winter Bright Simply Scrappin' Kit! Here is a view of the inside pocket. Here, you can see how the insert is actually a "pocket" for the gift card! Isn't this a beautiful card?!! I just love it!! I CASE'd it from the November issue of "Cards" magazine--page 118! This magazine is awesome! It's VERY expensive, but well worth it! There are hardly any ads, and each card comes with instructions!! oh--and the photos are beautiful!!! Ink: Bravo Burgunday, River Rock and Old Olive. The ribbon is the Chocolate Taffeta, and the brad is from the Ice Circle Rhinestone brads. This was my favorite card this month--well one of my favorites!! 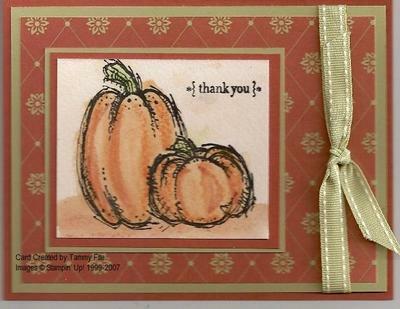 I used the Apple Cider Designer paper and the Autumn Harvest Stamp Set. I stamped the two pumpkins in Black Stazon. I used the masking technique--stamp the small pumpkin first, then cover it with a post it note (that you've stamped and cut out), and stamp your big pumpkin. Just remember--when masking stamp the image you want in front first! These are stamped on the watercolor paper, then colored in with the Watercolor Crayons and aquapainter. I used more mustard, really rust and old olive crayons. The card base is really rust, then a layer of River Rock, then the designer paper. I finished it off with the River Rock ribbon. I just love the simplicity of this card! Here is another card I made using the same colors as the 3x3 birthday card in the previous post! 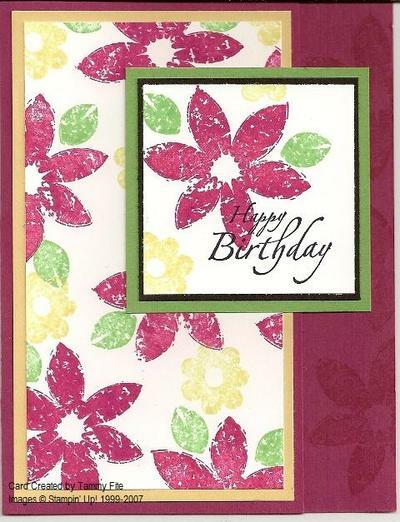 The card base is Purely Pomegranate, cut to 5 1/2" x 7 1/2", and scored at 4 1/4". Good Morning!! Here is a cute 3x3 card we made at our Card Club Meeting last week!! 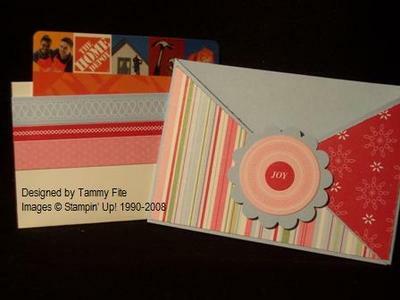 I used a So Saffron textured card (just cut cardstock to 6" x 3", and fold in half). Layered a piece of Purely Pomegranate (2 1/2" x 2 1/2"), then a 2 1/4" x 2 1/4" piece of Whisper White. I stamped the flower from Bud Basics in purely pomegranate, the leaves in Wild Wasabi and the small flowers in So Saffron. 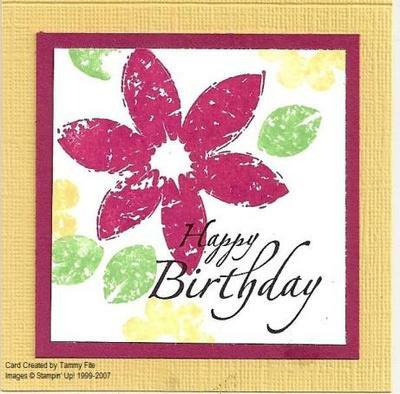 The sentiment is from the "It's Your Birthday" stamp set. Here is another card we made at the Technique Club meeting on Monday. The silver medallion is made by embossing several layers of silver embossing powder, then "stamping" your image into the still warm embossing powder. It's really beautiful up close!